Colour copy of art work by Jean MacKay a pupil at Skibo School, Clashmore, c.1941. 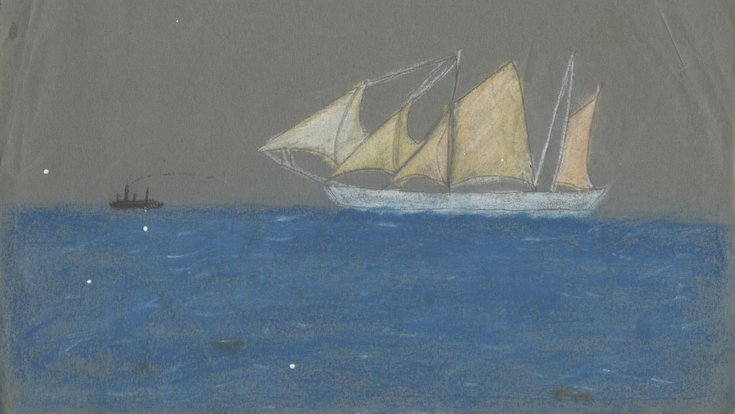 The subject, drawn on grey paper, is a sailing vessel on blue sea. It is understood that all children at the school drew similar pictures, which were then displayed as a frieze around the classroom wall. The Carnegie family maintained close links with the school, and the subject matter may have arisen from the fact that the family had a cruising yacht.